The Jungle Book based on the adaptation of Rudyard Kipling's classic novel comes alive in this exciting 40th Anniversary Platinum Edition, brilliantly restored with enhanced picture and sound. Experience the song-filled celebration of friendship, fun and adventure that was the last animated film to receive Walt Disney's personal touch. Embark on a thrilling, adventure-filled journey with the boy Mowgli as he makes his way to the man-village with Bagheera, the wise panther. Along the way he meets jazzy King Louie, the hypnotic snake Kaa and the lovable happy-go-lucky bear Baloo who teaches Mowgli "The Bare Necessities" of life and the true meaning of friendship. My webmaster should know that I’ve probably watched this Disney classic umpteenth times. I’ve watched it when I was a kid in primary school, I’ve watched it on a disc rented from a video store, I’ve watched it when it was broadcast on television, and I’ve even watched it when I was working temporarily at a cable network station. And why would I still be the one reviewing it? Is it because of the new digital restoration that makes Baloo the bear look clearer? Is it because of the catchy tunes in the 1967 movie that he knows I may dance along to? Or is it the tons of bonus materials included in this 40th anniversary edition that proudly says for a “limited time only”? I’d think it’s all the above and more, considering how this ageless tale of a man-cub makes his way back to the human village has enchanted audiences worldwide with its appealing charm. Based on Rudyard Kipling’s "Mowgli" story, the 79-minute animated feature sees the boy facing adventures with monkeys, vultures and a very fierce tiger while on his way back to where he belongs. There is fun, there is friendship and there is adventure – everything you’d expect from a Disney classic. Being the last movie Walt Disney worked on before he died, this is a joyously pleasing production which will make you reminisce about the jolly good times you had when you were younger. If you find the protagonist Mowgil extremely likeable, you’d probably have one joyful childhood yourself. Although the animation isn’t what you’d call technologically wowing today, it is the simple pencil sketches and the sincere storyline that will engage viewers both young and old. There are many characters in this movie that will provide lots of entertainment. From the hypnotic python and the militaristic elephants, to the cool British vultures and the silly apes, their antics and amusing behaviors will make you laugh in delight. Of course, the show belongs to the two animals that act as guardians to Mowgli: Baloo the bear and Bagheera the panther. These are the kind of big brothers you wish you had – the kind that tell you about “The Bare Necessities of Life”. This Special Edition Code 3 edition is loaded with heaps of extras (two discs worth of them! ), and if you are a Disney fan, you’d definitely want to own it on your DVD shelf. The classic movie has gotten the royal treatment it deserves. Commentary by Richard M. Sherman (composer), Andrea Deja (animator) and Bruce Reitherman (Mowgli’s voice) – In this very informative feature length commentary, you’d hear how the animators created Kaa the python’s special hypnotic voice, how Walt Disney acted out Baloo’s dancing steps, and also interestingly archived interviews of the original film’s animators weaved into the track. There is also this meaningful bit where they talk about how if the characters enjoy each other’s company on screen, the audience will enjoy the moment too. The Lost Character: Rocky the Rhino – In this six-minute clip, you’d see a storyboard scene of Rocky the Rhino, which is described as Mr. Magoo with horns. If he had not been deleted from the final version of the movie, he’d be singing a song with the vultures. Music and More – There is Jonas Brothers’ version of “I Wanna Be Like You”, the 12-minute “Disney Song Selection” of the four songs featured in the movie, as well as 21 minutes worth of “Deleted Songs” which interestingly features a love song entitled “I Knew I Belonged to Her” sung by Mowgli. Disney Wildlife Conservation Fund – This brief three-minute clip features adorable animals from several of Walk Disney’s animated features like “Bambi”, “The Lion King” and “Tarzan”. Basically it’s a feel-good video promoting the conservation fund founded by Disney to ensure the survival of animals living in the wild. The Bare Necessities: The Making of The Jungle Book – A very insightful documentary that runs at 46 minutes long which sees several film historians and animators talk about how Kipling’s classic novel was given the Disney treatment. Archival photographs and storyboards illustrate how the tale came to life with Walt Disney’s master storytelling skills. Did you know that the movie almost became a dark and moody animated feature until Walt Disney insisted for a fun and entertaining treatment? Disney’s Kipling: Walt’s Magic Touch on a Literary Classic – The 15-minute featurette tells you how the original version jumps forward and backward in time, and how Walt Disney decided to go for a linear approach and simplified many dramatic developments to achieve an accessible and entertaining movie. The Lure of The Jungle Book – Animators talk about how they have been influenced by the Disney classic and talk about how “a single line can carry so much weight” (whatever that means), how they watched the movie as a kid and refused to leave the outdoor theatre even when it started drizzling. Watch out for Brad Bird (The Incredibles, Ratatouille) as he talks about how animated characters should be given individuality like those in The Jungle Book. Mowgli’s Return to the Wild – In this brief five-minute clip, we see the voice of Mowgli, Bruce Reitherman (son of The Jungle Book’s director, Wolfgang Reitherman), has grown up to become a nature filmmaker, while retaining his father’s characteristics of personality and character in storytelling. It’s nice seeing the picturesque nature scenes in this clip. Frank and Ollie – In this four-minute archived featurette, animating director Frank Thomas and Ollie Johnston talk about how difficult it is to animate animals, citing Kaa the python and Baloo the bear as examples. Art Galleries – A generous platter of pictures from visual development, character design, storyboard art, layouts and backgrounds, production photos and publicity are offered in this section. Baloo’s Virtual Swingin Jungle Cruise – This one is for the kids. Baloo brings you through the jungle and plays interactive games with Kaa the python, Hathi and his army of elephants and Louie and his monkey gang. I had fun going through the cruise, even though I’m well above 25 years old. 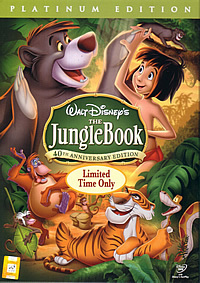 DisneyPedia: Junglemania! – This educational 14-minute featurette brings us into the deep Indian jungles to meet the real life counterparts of Baloo the bear, Bagheera the panther, Hathi the elephant and other wild animals from the movie. A lively narration will ensure that kids will have fun learning about these animals. The Jungle Book Fun with Language Games – This section is for even younger kids, where they have to identify animals with the help of pictures. This isn’t that fun for someone who is well above 25 years old. The disc’s visual transfer refreshes retains the wonderful animation of the all-time classic, and there are Dolby Digital 5.1 English, Mandarin and Korean, as well as 2.0 Thai and Cantonese audio tracks for viewers from this part of the world.